As someone who is not particularly interested in nor fascinated with the law, Kathryn Stebner is pretty darn good at practicing it. The principal of Stebner & Associates, based in San Francisco, thinks of herself more as champion for social change, an advocate for people and someone who wants to make a difference than she does as a lawyer. Stebner pursued a law degree at the University of San Francisco with designs on becoming a public interest lawyer and possibly working for a nonprofit. But the job market in that industry was thin after she graduated. She instead started her career at one of the top plaintiffs’ firms in the region, working on medical malpractice cases. It seemed to suit her fine because, as it happened, her interest in medicine was far greater than her attraction to law. Indeed, medicine, science and listening to people’s stories turned out to be Stebner’s strengths, and those strengths led her to discover relatively new areas of the law that did appeal to her. In 1987, while still working in medical malpractice, she took a case involving an elderly woman who died in a nursing home after taking a nasty fall. Stebner said the facility attempted to cover it up. It was her first elder-abuse case and quite possibly the first in the state. Today, Stebner does only elder-abuse work. She lectures frequently, teaches classes and seminars and has published more than a dozen articles on both physical and financial elder abuse. She also has testified before the state Legislature, something that seems to sate her penchant for politics. Once past the initial hurdles, Stebner embraced the freedom to shape her practice around the areas of the law she had grown to love. It also gave her an opportunity to impose her positive energy on the workplace, which meant maintaining a good mixture of pro bono work along with in-office stress-relieving rituals such as yoga and meditation – not to mention being the kind of boss she had always wanted to work for. She is also able to be more selective with her caseload. Stebner said her prospective elder-abuse cases usually must contain one or more of three key elements: a defendant with a bad history; a family who’s involved; and causation. But, she conceded, there are exceptions – there are whimsical reasons that she might take cases because with elder abuse, there’s so much emotion involved. When at trial, some of that emotion may come spilling forth, and she’s OK with that. In fact, she feels it’s important that the jury see her true colors. “For better or worse, I have to be completely myself in front of juries,” she said. “I’m a very emotional person, and I can’t really play games with them because I think I’m pretty transparent. So I’ve cried in front of juries, and I’ve gotten angry in front of juries. Stebner, a lesbian, has long been active in the LGBT community. She and her wife were two of 18,000 Californians who got married before Proposition 8 passed. 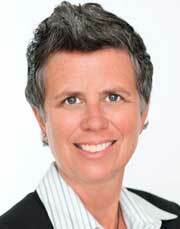 To her knowledge, she is the only openly gay member of the Consumer Attorneys of California board. She called it the other half of her life. “It’s been a bit of a roller coaster. It’s been huge,” she said. Stebner also dabbles in filmmaking – she’s made some experimental films and documentary films and taken classes in San Francisco and Oregon, something she said she’d like to get back into. She used to make films of SFTLA events, interviewing award-winners and having fun with her colleagues. It’s that approach Stebner preaches to her USF law school students and young practicing attorneys – that your passion should drive your career, not financial or material aspirations. Stebner’s advice: “Assume that you can do what you love and still make a living at it – they’re not mutually exclusive. When I was in law school, I figured I was going to be a public interest lawyer and make $30,000 the rest of my life, and I was OK with that.